We’ve been getting lots of great feedback here at Posted in Paris: traffic is up (way up!) as are Facebook “likes” and complimentary comments (both on-line and in person). A thousand thanks to all of you! And if you’ve been enjoying what you’ve read here, now it’s time for you to pitch in. Now if this were public radio, we’d be interrupting the programming every 20 minutes to beg for money and a handful of you would dutifully shell out your 20 bucks and get the mug and the satisfaction of being a solid citizen. We don’t need money but we still could use your support. Posts are in the works on a variety of topics from doctors and dentists to extracurricular activities for kids to French language schools and even weekend trips from Paris. The problem is that the copy is a bit thin or geographically patchy. So if you’ve had a good experience with a health professional; your kid is enjoying dance, art, or le foot; your French is picking up due to a dynamite teacher, then pass along the tip either by leaving a comment here or by sending a quick e-mail to parisplaces@yahoo.com. Addresses and phone numbers for the places or people you are recommending are an absolute must so be sure to include those. And if there’s any other tip you’d like to share with other Posted in Paris readers, feel free to pass that along as well. Favorite Paris book? Best place to get knitting supplies? A secret source for Dr. Pepper? Thoughts on the best cell phone provider? We’re counting on you! Because there are so many great travel Web sites out there, we’ve shied away from giving advice on travel from Paris. Recently, however, a number of folks have expressed interest in learning more about day trips from Paris. Just what constitutes a day trip is open to interpretation, depending upon your means of transportation and how far you’re willing to travel. Several of these destinations could easily become weekend visits. That being said, here are a few ideas to get your creative juices flowing. 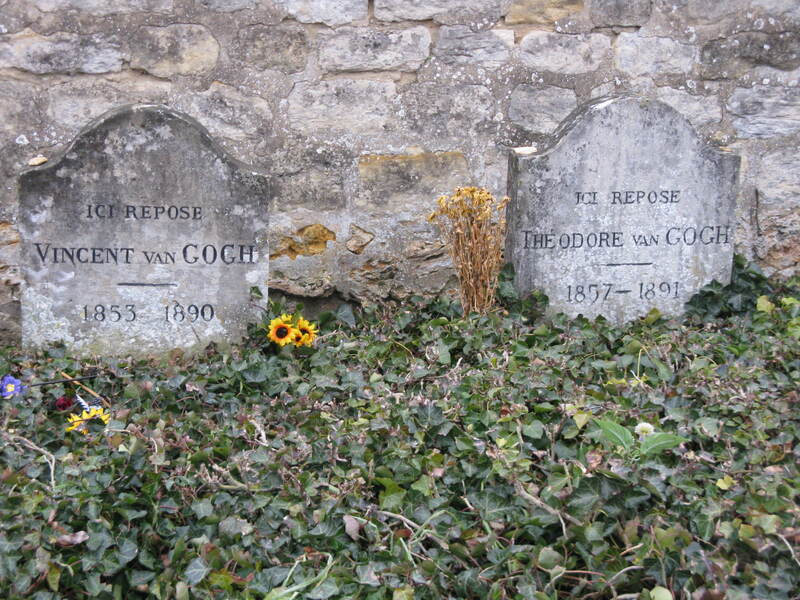 Auvers sur Oise: Van Gogh’s final resting place and site of many of his famous paintings. In addition to paying homage at his grave site, you can visit the inn where he lived and the home of Dr. Gachet, one of his patrons. There is also a museum dedicated to the work of French artist Charles-François Daubigny and the Musee de l’Absinthe. If the weather is nice, you may enjoy a self-guided walk through the town; along the route, there are placards of paintings you will recognize, placed at the very vantage point of the works themselves. Auvers sur Oise is accessible by SNCF train from Gare du Nord. Check with the tourist office for opening and closure information; many sites are closed during the winter months. 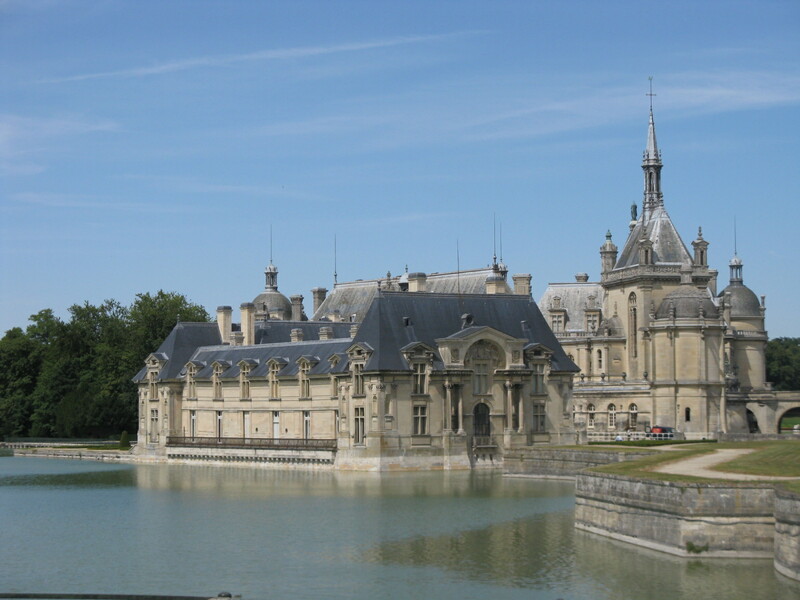 Chantilly: There’s plenty to do here besides eating whipped cream (although when in Rome….). The chateau has an incredible art collection and the grounds have recently been renovated to include special activities of interest to kids such as a maze and a kangaroo farm. Then there’s the horse museum which is a bit dated but still fun. Call ahead for information on dressage demonstrations and the equestrian spectacle. And you can always go to the races. It’s a quick train ride from Paris; you can easily walk from the station into town. If not, take the free city bus. 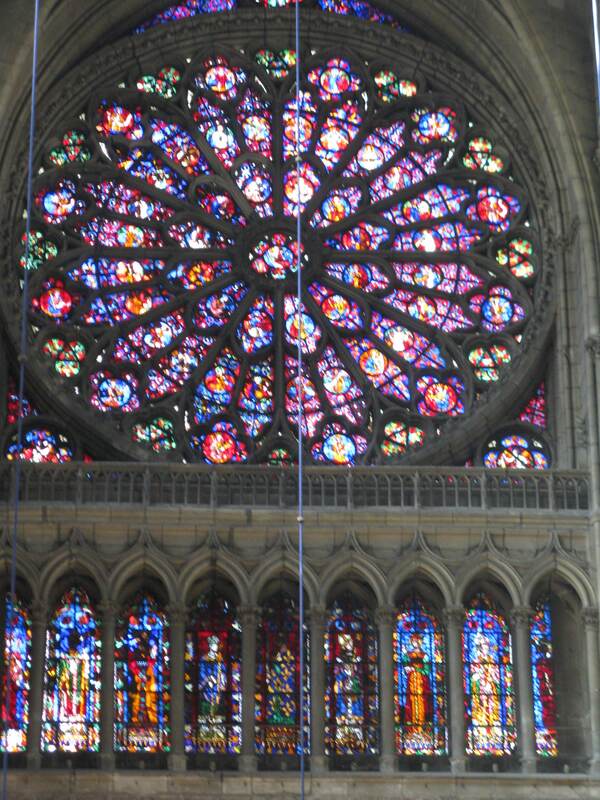 Chartres: This town, just 100 kilometers southwest of Paris, is best known for its Gothic cathedral dedicated by King Louis IX in the 13th century. It is one of the few religious sites in France that was not substantially damaged during the French Revolution. The stone floor is marked with a labryinth which pilgrims still walk. In addition to the church, there is also a small museum of stained glass. Trains run regularly between Gare Montparnasse and Chartres. Euro Disney: After initial grumbling, France and the rest of Europe seemed to have embraced Euro Disney with open arms. Much smaller than its American counterparts, you can probably do it in one day although this depends upon the number of other visitors. Heather Stimmler-Hall, author of the Secrets of Paris blog, has put up a post in two parts with great tips on making the most of your Disney experience. You can get started at How To Survive Disneyland Paris Part 1. Euro Disney is easily accessible by the RER A.
Fontainebleau: Home of French kings for centuries, Fontainebleau grew in a fashion one can only describe as higgledy-piggeldy and thus there’s something here for everyone from the grand Renaissance to Napoleon’s library. The park is vast and the nearby forest is a great place to explore and climb on the rocks. The SNCF train from Gare de Lyon stops in Fontainbleau-Avon; from there, you can take a city bus to the chateau. (It is a very long walk otherwise.) If you have a car, plan on also visiting the nearby village of Barbizon which was an artist’s colony in the early 19th century. 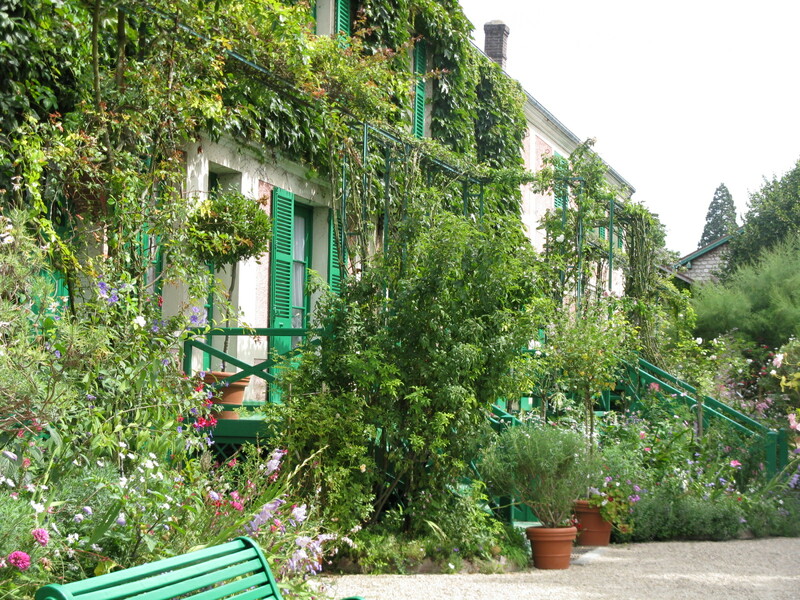 Giverny: The main attraction at this tiny town in Normandy is Claude Monet’s home and garden, the setting for many of his famous paintings of water lilies. You won’t find any original Monets in the house but it is charming all the same. The garden is spectacular in spring, summer, and fall. There is also a small art museum dedicated to the work of the Impressionists just down the lane. If you don’t have a car, take a train from Gare St. Lazare to Vernon where you can either take a bus or rent a bike to travel the remaining 5 kilometers to Giverny. The buses are well-timed with arrivals and departures from Paris. Provins: This fortified medieval town on the eastern edge of Ile de France is on UNESCO’s list of world heritage sites. The old town is perched on a hill above the new town where the train comes in. You can walk the ramparts, climb the Tour César and visit a number of other historic buildings, and stroll to the sweet town square where you’ll want to get a bite to eat or linger over a drink. Two different spectacles will delight your kids: one featuring falcons and the other horses. Reims: The cathedral in Reims is where the kings of France were crowned and is well worth the quick 45 minute ride on a TGV from Gare de l’Est and it’s not that much further by car. Visit the Bishop’s Palace to learn more about the construction and restoration of the cathedral. Reims is also the heart of Champagne and you can visit some of the big houses in town on foot including Veuve Cliquot, Charles de Cazanove, and Pommery. For the others, you will need a car to get out into the countryside. There’s also an automobile museum and a small exhibit at the site where Eisenhower as chief of the Allied Forces in World War II accepted the German surrender. Versailles: There’s the grand chateau itself, the park, the Grand and Petit Trianon, and Marie Antoinette’s hamlet. Take the RER C to the Rive Gauche station or the SNCF train to Rive Droite and make a day of it. Picnicking is permitted on the grounds although not necessarily on the lawns. During the summer and into the fall, the fountains are synchronized with music on Tuesdays. Today’s post and pictures are reposted with permission from the HIP Paris blog. The author is Erica Berman, an American by birth, who has called Paris home on-and-off for 17 years. She is also owner of Haven in Paris, a luxury vacation rental company. After over 17 years of Frenchie living, I am largely used to the etiquette of dining chez les Francais – along with all of their implicitly understood rules and regulations. 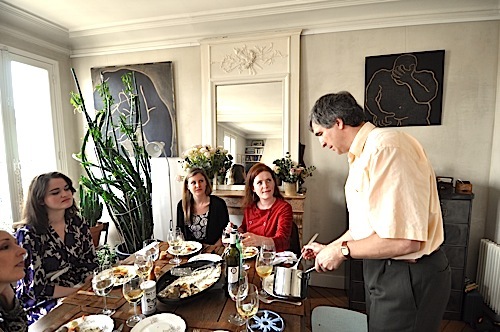 A brunch with Parisian friends for which the first guest arrived 30 minutes after the announced time, and an 8 pm French dinner party invitation with food finally served at 10 pm, prompted the following list of tips for enjoying error-free dining in the land of berêts, baguettes and smelly cheese. Les Faux Pas qu’il ne Faut pas faire (errors to avoid), a few pointers for socializing Chez les Francais with hopes of avoiding unnecessary uncomfortable moments. Rule 1: Never, never, never arrive early. Not even one minute. This is highly unacceptable (and unheard of) behavior in France. Walk around the block a few times, have a café, do some lèche-vitrine (window shop), but do not ring that bell even one minute in advance. Rule 2: Never arrive right on time either, except for a formal meal, or in a restaurant. Even for a sit- down meal, your host will expect you 5-10 minutes late. For a party, a casual brunch or cocktail, you will be expected 20-45 minutes past the specified time. Arriving on the dot might find your host not only not ready, but also not particularly overjoyed by your presence. 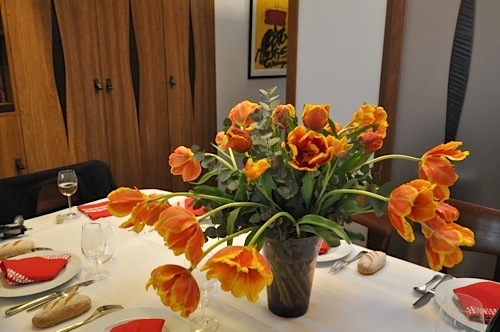 Rule 3: Always bring a little something for the host, be it a bottle of wine, a homemade goodie or a bouquet of flowers. Remember, showing up empty-handed is seriously frowned upon in France. Note: Do not bring gifts of soap or bouquets of mums. 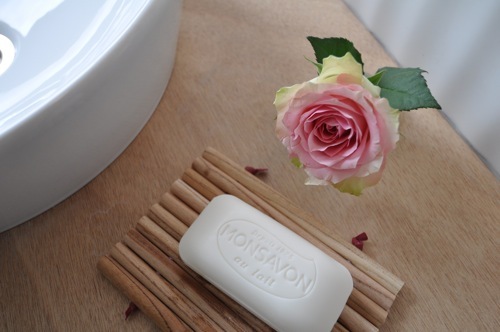 Soap makes your hostess feel like you are implying she doesn’t wash, and mums are brought to cemeteries to cover gravestones. Rule 4: In France, à table (at the table), one does not speak of politics, money, or religion. One does not ask a French person their salary, their religious beliefs or who they voted for. This is the ultimate insult to a Frenchie! Rule 5: You don’t have to help with dishes. In the U.S. it’s the norm, even rude, not to help your host clean up the mess. In France the logic is that you are the guest and you are there to relax. When you invite your friends over they will expect you to extend the same courtesy and will not offer to help you with any of the clean-up either. The first few times this happened in my apartment I was annoyed at the lack of help. Now, I appreciate being able to relax when dining out and letting my guests relax when they dine chez moi. Rule 6: Eat what is on your plate. 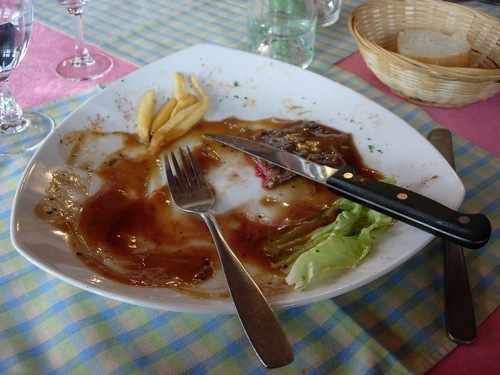 The French have low (up from no) tolerance for finicky eaters. It is very rude to decline what your host has prepared, and even ruder not to finish what is on your plate. NOTE: If you are a vegetarian or have a true food allergy don’t be shy. Your host just might be sympathetic. Rule 7: Remain open-minded. Try everything. From blood sausage, steak tartare, pan-fried fois gras, rabbit w/prunes, baked pigeon and deer stew to escargot, raw sea urchins, fried oysters, frogs legs, tripe and andouillette, I have been there and tried that. 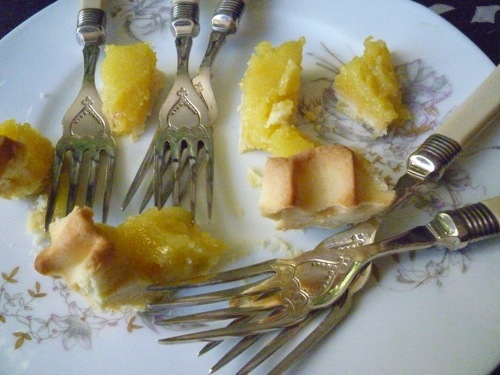 These dishes are not found in my normal eating repertoire, and there may not be a second time for many of them, but I think my hosts appreciated the effort that went into my sampling of their fare. Not only will the French be impressed by your ability to reach out of your American comfort zone, you may just discover a new favorite. If you follow fashion, stop reading this post now. And if you’re a guy, you might want to move on as well. Today’s sage wisdom is for the lady concerned about making a good impression in Paris without having to buy a whole new wardrobe or going too wild and crazy trying to stay current with fashion trends. Yes, Paris is the world’s fashion capital but relax. Not everyone dresses up here all the time. You can do just fine in Paris as long as you have a few basics in your closet and follow a few simple rules. Don’t worry about being dressed up; just don’t dress down. Some Parisiennes go all out: killer heels, fabulous jewelry, couture, the works. You don’t have to follow suit if that’s not you. Instead, think polished, classic, and restrained. And don’t think about going out of the house in your gym clothes unless you are actually going to the gym. Sweats and sneakers are fine for jogging but a big no no at the bank, the post office, and the market. Save your shorts for the tennis court or for summer in the countryside. Yes, you can wear jeans. Honestly every third person walking down the street in Paris is in a pair of jeans. The twist? They’re not slouchy (unless you are a 17 year old gansta rapper wannabe), holey (unless you are a 22 year old rail thin model), or grubby. A well fitting, crisp pair of jeans is what you want. With a pair of boots, a white button down shirt or a nicely fitted knit top, and a great jacket, you’ll fit right in. Invest in comfortable shoes. Parisiennes do a lot of walking. How those gals in heels do it, I cannot fathom. And reserve your sneakers (unless they are Converse All-Stars) for the gym. Instead, consider making your way around town in ballet flats, boots, loafers, or any shoe that has a chunky heel. Think layers. The weather in Paris is fickle; temperatures can swing wildly during the day, particularly in spring and fall, while the sun plays peekaboo. Light cardigans and tops you can layer make a lot of sense. Make sure you really like your raincoat because you are going to be wearing it a lot. Right now trenches are popular and for good reason. They work fall and spring, look great with skirts and slacks, and they keep you dry when Parisian skies open up. A raincoat with a zip in lining is the best bet. With a scarf and the lining in, you will stay warm on even the coldest day (which admittedly is never much below zero (Celsisus, that is). Zip it out and you are good to go in spring and fall. Black is the new black. Parisiennes wear a lot of black. You don’t have to, but look at this way. A great pair of black slacks or a black skirt goes with pretty much everything. Make sure your purse is a shoulder bag that zips shut. Clutches, purses hanging on your wrist, backpacks, and anything gaping open is a ready target for pickpockets. A shoulder bag, either one with a strap that goes across your body or short straps that allow you to hold your bag snugly under your armpit, is a lot more secure. Consider stocking up. If you are tall, round, big busted, or have big feet, it’s probably not a great idea to wait until you get to Paris to go shopping. To make a gross overgeneralization, the average French woman is petite: trim and not very tall. So unless you relish the hunt, go ahead and buy an extra pair of the shoes you love or your favorite jeans and put them aside for later. Time for another language lesson from ielanguages.com, an incredible, free on-line French language resource created by Jennie Wagner, an English lecturer at the Université de Savoie in Chambéry, France. Jennie has graciously allowed Posted in Paris to repost several of her tutorials. Make sure you follow the links in each post back to her site for the sound files. Today: some useful vocabulary for setting up a cell phone account and dealing with computer problems. You can find the sound files here. Sound files can be found here at #95. What’s the best way to stay up to speed on what’s going on in Paris? There’s no one answer but here are a few ideas that will put you on the road to being considered in the know. Read the newspaper: Obvious right? Or perhaps just hopelessly old-fashioned. Even if your French skills are limited, scanning the paper, any paper, will do you good. Le Parisien and France-Soir are easier to read than Libération and Le Monde. Even better, pick up one of the free papers available at your neighborhood métro station. I don’t know for sure but it seems like these papers (Métro, Direct Matin, and 20 Minutes) are written for about a 5th grade literacy level. If nothing else, you should pick up Le Figaro on Wednesdays when it includes the entertainment insert, Figaroscope. And if you can’t read a word of French, try the on-line English language entertainment guide, Paris Update. Follow Paris blogs: It doesn’t matter whether you just surf on over every now and then for a visit or subscribe to a feed. Just make it a point to take of the advantage of their wisdom and knowledge of upcoming events. Particularly good bets are Paris by Mouth, Secrets of Paris and Paris Weekends. Pay attention to posters: The city of Paris sponsors many festivals and it seems like every weekend, there’s some kind of fete with themes as wide ranging as gardening, food and wine, music, art, cinema, sport, and, biodiversity. In addition, there are frequent expositions at the large convention centers at Porte de Versailles and Porte de Champerret; these feature vendors, demonstrations, and all manner of activities on a single theme: interior design, manga, independent vintners, automobiles, and yes, of course, chocolate. Make friends: Two heads are definitely better than one. Tap into the expertise of colleagues, parents of your kids’ friends, fellow parishioners, and other members of expat organizations like the American Women’s Group, WICE, the American Chamber of Commerce, Paris Alumnae/i Network, and MESSAGE. And take a look at Meetup Paris, an online forum that helps folks connect with others who have similar interest, whether that’s forming a playgroup for babies or playing rugby. Need new soccer cleats? Going skiing for the first time? Your kid decides to take up tennis? Here’s where to go. For the serious outdoorsy type, head to Au Vieux Campeur in the Latin Quarter. This store, actually a collection of stores scattered in and around rue des Ecoles, has everything you’ll need for hiking, camping, skiing, water sports, plus tons of maps and guides. The only trick is that each department is in a different location (with 26 in all) so you’ll want to check the Web site before you go. If you are on a budget or buying gear for a first timer, a better bet is Decathlon. Relatively few consumer goods in France can be described as bargains when compared with North America, but Decathlon is definitely the exception. Where else can you find a sleeping bag for under 10 euros or a fleece pullover for under 8? This gear won’t last a lifetime and certainly won’t work in extreme conditions, but it will get you through. There are four locations in the city of Paris: avenue de Wagram, near L’Etoile; Madeleine; Aquaboulevard (in the 15th) and Avenue de France (in the 13th) plus multiple others around Ile de France. Another multipurpose address for the budget conscious is Go Sport which has multiple locations in or close to Paris including Italie 2, La Defense, Les Halles, Montparnasse, Porte de St. Cloud, and Republique. I like Posted in Paris!